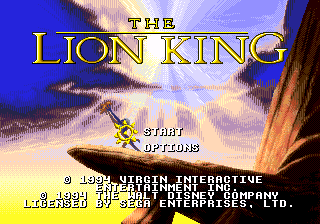 The Lion King (ライオンキング) is a platform game developed by Westwood Studios, Inc., Virgin Interactive, and Dark Technologies, and published by Virgin Interactive, Walt Disney Computer Software, and Sega for the Sega Mega Drive, Sega Game Gear, Sega Master System, and several other consoles. It was developed for the Lion King franchise and follows a story and plot similar to the film. Due to this, it was one of the first games that featured a protagonist that gets older during the game's progress. The gameplay also changes from mainly platforming to a more action oriented approach. Although intended for children, the game was often criticized for its difficulty even with easier settings. Despite the difficulty, it was rated positively by reviewers and gamers alike. The second level in The Lion King is one of the hardest the game has to offer, specifically designed to appease management at Disney who wanted a longer game. This call came too late in development for the team to add new levels, so this stage saw its difficulty increase significantly, meaning it would take longer to complete. The reasoning is thought to be behind Disney's approach to the rental market. Disney had set specific metrics regarding how far an average player should have progressed in a set period of time - if a game was too easy, the user would be less likely to buy the full retail product. The Game Gear and Master System versions present this stage from a side-on perspective. Simba's return to the pridelands was cut from the final draft of the film, however as the game was made in conjunction with the script, these levels was produced before the decision was made. Reportedly Virgin Games had to fight to keep them in the final product, as Disney wanted the game to be as true to the film as possible. The Master System and Game Gear versions scrap most of this stage, only including the end fight with Scar. Sound Driver: Krisalis Software, Ltd.
Additional Music: Jeff Rona-Media Ventures, Inc.
Main article: The Lion King/Magazine articles. Main article: The Lion King/Promotional material.